Once you understand that your telephone communication is not Secure you will think twice before transmitting any sensitive information. Our customers and Law enforcement and fortune 1000 companies, insurance companies and CEOs that understand that information must be contained and intended only for the selected recipients. 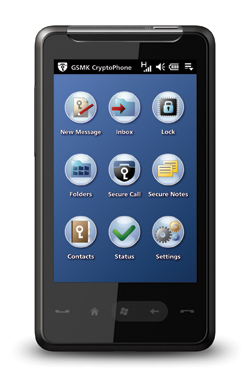 CryptoPhone 400 gives you the flexibility to conduct secure voice over IP calls using either GSM, 3G/UMTS, or wireless local area networks. Our new Encrypted telephone allow you to have piece of mind knowing no one else can be entertained with your private business.